Tim began his career with the youth set-up at Millwall, but was released in May 1997. He joined Camberley Town while continuing his University education and in a 1½ season, clocked up and impressive 29 goals. Early in 1999, he joined Basingstoke Town and spent some three seasons with the club, making over 100 appearances. Again, his goalscoring record was pretty impressive, scoring some 33 goals. 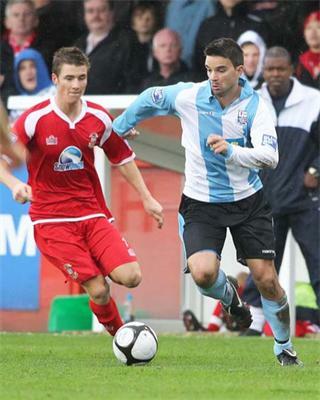 He also had loan spells with Staines Town and Kingstonian, before making a permanent move to Kingstonian in July 2002. He won an England C cap while with the club, but the following season, Tim joined Conference side Aldershot Town and once again, produced an impressive scoring record with 43 goals in 96 games for the Shots. Several League sides took an interest, and it was Oxford United who signed the striker in January 2006, for a £50,000 fee. He struggled however, and after a limited number of games, moved on to Hereford United some six months later on a two-year deal. After a year with the Bulls, he joined Torquay United in the summer of 2007, and was part of the promotion winning side the following season, scoring in the game which secured their return to the Football League. Once again, he struggled in the Football League and was released in January 2010, joining Stevenage Borough on an eighteen month contract. This time, he helped Borough to the Conference title. Tim Sills arrived at Nene Park on a three month loan deal from the renamed Stevenage on 24 September 2010. He made his Diamonds debut two days later in the game against Crawley Town at Nene Park, and scored his debut goal for the club with the winner against Mansfield Town on 9 October. With the completion of his loan on 26 December 2010, he returned to Stevenage, but was allowed to move back to Aldershot Town on 17 January 2011. He was released at the end of the season, and rejoined Conference South side Basingstoke Townon 4 July 2011. Following two years with Basingstoke, Tim joined Southern Premier side Bashley on 27 July 2013. Following an announcement on the reduction in the playing budget, Tim left the club and joined Conference South side Gosport Borough on 17 October 2013. He departed at the end of the season, joining Southern Premier side Weymouth on 18 June 2014. He signed with Blackfield & Langley as player-coach for the 2016/17 season, aged 36. After a season there he retired from the game to launch a football academy.